Gustavus Senior Johanna Johnson will perform her final recital accompanied by Joe Robinson of the New York Philharmonic. Johanna Johnson remembers a large group of national media types waiting for her at Lincoln Center, where she was going to meet Joe Robinson in 1999. The media were all there, surely, to capture one of those uplifting Christmas-season stories that write themselves — in this case that of a Make-A-Wish kid about to meet up with the guy who would help grant it. 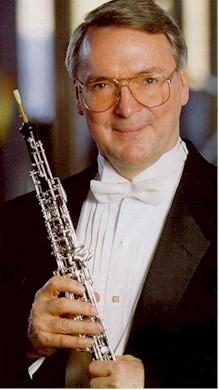 Johnson was 16 at the time and a passionate oboe player who had been diagnosed with lymphoma. She made the trip from her hometown in California to New York to realize a dream of not only rehearsing with the New York Philharmonic, but to sit in with the orchestra during a performance, wear a formal black dress and hold her instrument. “I just wanted to sit in the middle with the music all around me,” she later said. “The Phil” had allowed this kind of thing only once, years ago, when participatory journalist George Plimpton played triangle one evening under direction of Leonard Bernstein. (Plimpton later wrote that the intense experience terrified him.) Other than that, it was a members-only organization, the members being some of the greatest players in the world. As she approached those gathered, she didn’t see Robinson. He was to meet her here, and he had become an idol of sorts for her once she submitted her request to the Make-A-Wish Foundation for this favor. She learned of him on the Internet and was amazed, she said, at his varied career and eclectic interests, from his humanitarian interests to his accomplishments as the nation’s foremost oboist. “I thought ‘this is the guy I want to meet’,” she says. On this December day in New York, Johnson had her oboe with her and two inches of hair that was re-growing following cancer treatment. Now a senior at Gustavus Adolphus College, Johnson will perform her senior recital on April 29 in the Jussi Bjorling Recital Hall — accompanied by Robinson, with whom she has remained in close contact as her musical skills continue to flourish and her cancer recedes. Since that first meeting near the Lincoln Center Christmas tree, Robinson arranged for Johnson to attend summer camp and has performed in her hometown of Grass Valley, Calif. They keep in touch often. To some degree, Robinson says, he’s simply returning a favor by performing in her town, as she did in his. 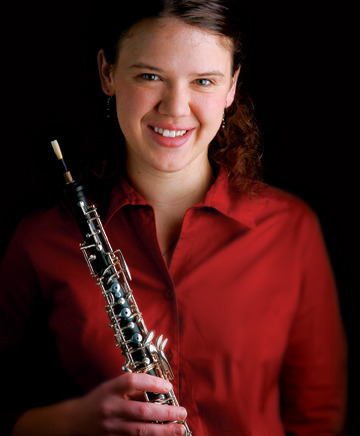 Indeed, on the night of that 1999 concert Johnson was able to do more than sit amid the music — she played alongside Robinson on Aaron Copeland’s Third Symphony which includes “Fanfare for the Common Man.” And she played with a brand new Loree oboe that Robinson had given her at their meeting. And her performance, Robinson recalls, was stellar. Robinson will visit Gustavus for a week, serving as an artist-in-residence and performing with the Gustavus Symphony Orchestra on the morning of the 29th, at Johnson’s recital that evening, and then with the Gustavus Wind Orchestra on the morning of the 30th. Johnson said she’s been pulling for Gustavus to bring Robinson to campus for most of her years at the college. The Make-A-Wish Foundation of Minnesota grants the wishes of children with life-threatening medical conditions to enrich the human experience with hope, strength, and joy. It was established in 1982 and has since granted more than 2,300 wishes, and is one of 74 Make-A-Wish chapters serving the United States and its territories. With the support of generous donors and more than 25,000 volunteers, the Make-A-Wish Foundation has granted more than 127,000 wishes worldwide since its inception in 1980. For more information on the Make-A-Wish Foundation of Minnesota, call (763) 571-9474 or visit its Web site at www.wishmn.org.